Mr. Arnold Lieb arrived to St. James Rehabilitation and Healthcare Center on May 10, 2017 from an inpatient hospitalization at Stony Brook University Hospital on Long Island, New York. Mr. Lieb first admitted to Mather Hospital with several urinary tract infections accruing on many different occasions. Finally, Mr. Lieb decided to undergo a surgical procedure to relieve his infections. Just prior to Mr. Lieb’s scheduled procedure, he began to develop symptoms of a heart attack. He was then transferred to Stony Brook University Hospital for additional support and evaluation. After his successful procedure, Mr. Lieb was notified that he would required extensive inpatient rehabilitation to support his range of motion and ability to ambulate once returning home. 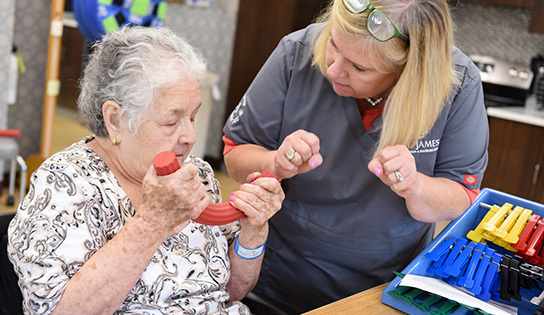 His three daughters researched the list of skilled nursing facilities capable of providing his level of care and subsequently selected St. James Rehabilitation and Healthcare Center as a results of an appreciated community tour and excellent care. Mr. Lieb was warmly greeted by multiple professionals of team St. James, whom anticipated his arrival. Within the first 24 hours, he was greeted by several clinicians including that of, therapists, nurses, physicians, administrative staff and several other valued members of the team to welcome him and answer any questions that he or his family may have had. His two therapists, Kathy and Cindy, began his therapy at beside to evaluate his current state of health. He arrived to St. James as a modified assist with transfers and bed mobility. Mr. Lieb realized he had a long journey ahead of him, but had nothing but positive thoughts along the way. At one point in his life he overcame a stroke, diabetes, and the loss of his right eye; he knew he was going to beat the odds of accomplishing his rehabilitation goals. Mr. Lieb’s discharge date is soon nearing, and even though he loved it here with all of us at St. James, leaving will be a bittersweet moment. He cannot wait to be home to celebrate his love with his eight grandchildren and his three loving daughters. Team St. James is thrilled for Arnold and his incredible achievements while under our care. We wish him nothing but the best and a continued happy and healthy 2017!